"Psychology of Music" redirects here. For the journal, see Psychology of Music (journal). Music psychology, or the psychology of music, may be regarded as a branch of both psychology and musicology. It aims to explain and understand musical behaviour and experience, including the processes through which music is perceived, created, responded to, and incorporated into everyday life.Musicology is the study of music. ("Musicology" Britannic Academic,2013). Encyclopædia Britannica. If the word "ology" is "the study of", then Musicology is the study of music. That is the way scientist defined it, which isn't wrong. Music is everywhere: in movies, radio, advertisement, stores, and on your phones; therefore, a lot of people get curious about the effects of music and the musical experience on people. There is a variety of studies of music, such as adolescent influence, culture psychology, personality psychology, etc. (Schafer, 2013, pg1) Modern music psychology is primarily empirical; its knowledge tends to advance on the basis of interpretations of data collected by systematic observation of and interaction with human participants. Music psychology is a field of research with practical relevance for many areas, including music performance, composition, education, criticism, and therapy, as well as investigations of human attitude, skill, performance, intelligence, creativity, and social behavior. The study of sound and musical phenomenon prior to the 19th century was focused primarily on the mathematical modelling of pitch and tone. The earliest recorded experiments date from the 6th century BCE, most notably in the work of Pythagoras and his establishment of the simple string length ratios that formed the consonances of the octave. This view that sound and music could be understood from a purely physical standpoint was echoed by such theorists as Anaxagoras and Boethius. An important early dissenter was Aristoxenus, who foreshadowed modern music psychology in his view that music could only be understood through human perception and its relation to human memory. Despite his views, the majority of musical education through the Middle Ages and Renaissance remained rooted in the Pythagorean tradition, particularly through the quadrivium of astronomy, geometry, arithmetic, and music. Research by Vincenzo Galilei (father of Galileo) demonstrated that, when string length was held constant, varying its tension, thickness, or composition could alter perceived pitch. From this he argued that simple ratios were not enough to account for musical phenomenon and that a perceptual approach was necessary. He also claimed that the differences between various tuning systems were not perceivable, thus the disputes were unnecessary. Study of topics including vibration, consonance, the harmonic series, and resonance were furthered through the scientific revolution, including work by Galileo, Kepler, Mersenne, and Descartes. This included further speculation concerning the nature of the sense organs and higher-order processes, particularly by Savart, Helmholtz, and Koenig. 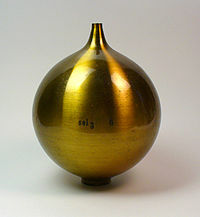 A brass, spherical Helmholtz resonator based on his original design, circa 1890-1900. The latter 19th century saw the development of modern music psychology alongside the emergence of a general empirical psychology, one which passed through similar stages of development. The first was structuralist psychology, led by Wilhelm Wundt, which sought to break down experience into its smallest definable parts. This expanded upon previous centuries of acoustic study, and included Helmholtz developing the resonator to isolate and understand pure and complex tones and their perception, the philosopher Carl Stumpf using church organs and his own musical experience to explore timbre and absolute pitch, and Wundt himself associating the experience of rhythm with kinesthetic tension and relaxation. As structuralism gave way to Gestalt psychology and behaviorism at the turn of the century, music psychology moved beyond the study of isolated tones and elements to the perception of their inter-relationships and human reactions to them, though work languished behind that of visual perception. In Europe Géza Révész and Albert Wellek developed a more complex understanding of musical pitch, and in the US the focus shifted to that of music education and the training and development of musical skill. Carl Seashore led this work, producing his The Measurement of Musical Talents and The Psychology of Musical Talent. Seashore used bespoke equipment and standardized tests to measure how performance deviated from indicated markings and how musical aptitude differed between students. In 1963 F. Chrysler was the first one to used the term " science of music" when he was working on his "year book for musical" knowledge. European musicology was found in Greek. They were focus on the philosophy, and the concepts of any relations with music. Greek's several theories rose later on to Arab and the Christians Theories. Although their theories survived, they were also corrupted along the way, in the Middle Ages of Europe. Music psychology in the second half of the 20th century has expanded to cover a wide array of theoretical and applied areas. From the 1960s the field grew along with cognitive science, including such research areas as music perception (particularly of pitch, rhythm, harmony, and melody), musical development and aptitude, music performance, and affective responses to music. This period has also seen the founding of music psychology-specific journals, societies, conferences, research groups, centers, and degrees, a trend that has brought research toward specific applications for music education, performance, and therapy. While the techniques of cognitive psychology allowed for more objective examinations of musical behavior and experience, the theoretical and technological advancements of neuroscience have greatly shaped the direction of music psychology into the 21st century. While the majority of music psychology research has focused on music in a Western context, the field has expanded along with ethnomusicology to examine how the perception and practice of music differs between cultures. It has also emerged into the public sphere. In recent years several bestselling popular science books have helped bring the field into public discussion, notably Daniel Levitin's This Is Your Brain On Music (2006) and The World in Six Songs (2008), Oliver Sacks' Musicophilia (2007), and Gary Marcus' Guitar Zero (2012). 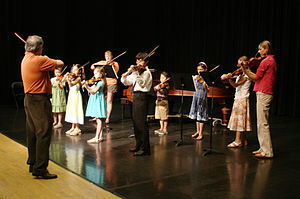 In addition, the controversial "Mozart effect" sparked lengthy debate among researchers, educators, politicians, and the public regarding the relationship between classical music listening, education, and intelligence. Much work within music psychology seeks to understand the cognitive processes that support musical behaviors, including perception, comprehension, memory, attention, and performance. Originally arising in fields of psychoacoustics and sensation, cognitive theories of how people understand music more recently encompass neuroscience, cognitive science, music theory, music therapy, computer science, psychology, philosophy, and linguistics. Music has been shown to consistently elicit emotional responses in its listeners, and this relationship between human affect and music has been studied in depth. This includes isolating which specific features of a musical work or performance convey or elicit certain reactions, the nature of the reactions themselves, and how characteristics of the listener may determine which emotions are felt. The field draws upon and has significant implications for such areas as philosophy, musicology, and aesthetics, as well the acts of musical composition and performance. The implications for casual listeners are also great; research has shown that the pleasurable feelings associated with emotional music are the result of dopamine release in the striatum—the same anatomical areas that underpin the anticipatory and rewarding aspects of drug addiction. A significant amount of research concerns brain-based mechanisms involved in the cognitive processes underlying music perception and performance. These behaviours include music listening, performing, composing, reading, writing, and ancillary activities. It also is increasingly concerned with the brain basis for musical aesthetics and musical emotion. Scientists working in this field may have training in cognitive neuroscience, neurology, neuroanatomy, psychology, music theory, computer science, and other allied fields, and use such techniques as functional magnetic resonance imaging (fMRI), transcranial magnetic stimulation (TMS), magnetoencephalography (MEG), electroencephalography (EEG), and positron emission tomography (PET). The cognitive process of performing music requires the interaction of neural mechanisms in both motor and auditory systems. Since every action expressed in a performance produces a sound that influences subsequent expression, this leads to impressive sensorimotor interplay. Perceived pitch typically depends on the fundamental frequency, though the dependence could be mediated solely by the presence of harmonics corresponding to that fundamental frequency. The perception of a pitch without the corresponding fundamental frequency in the physical stimulus is called the pitch of the missing fundamental. Neurons lateral to A1 in marmoset monkeys were found to be sensitive specifically to the fundamental frequency of a complex tone, suggesting that pitch constancy may be enabled by such a neural mechanism. Pitch constancy refers to the ability to perceive pitch identity across changes in acoustical properties, such as loudness, temporal envelope, or timbre. 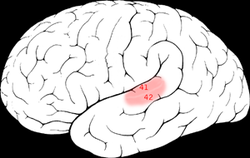 The importance of cortical regions lateral to A1 for pitch coding is also supported by studies of human cortical lesions and functional magnetic resonance imaging (fMRI) of the brain. These data suggest a hierarchical system for pitch processing, with more abstract properties of sound stimulus processed further along the processing pathways. Absolute pitch (AP) is defined as the ability to identify the pitch of a musical tone or to produce a musical tone at a given pitch without the use of an external reference pitch. Researchers estimate the occurrence of AP to be 1 in 10,000 people. The extent to which this ability is innate or learned is debated, with evidence for both a genetic basis and for a "critical period" in which the ability can be learned, especially in conjunction with early musical training. Behavioural studies demonstrate that rhythm and pitch can be perceived separately, but that they also interact in creating a musical perception. Studies of auditory rhythm discrimination and reproduction in patients with brain injury have linked these functions to the auditory regions of the temporal lobe, but have shown no consistent localization or lateralization. Neuropsychological and neuroimaging studies have shown that the motor regions of the brain contribute to both perception and production of rhythms. Even in studies where subjects only listen to rhythms, the basal ganglia, cerebellum, dorsal premotor cortex (dPMC) and supplementary motor area (SMA) are often implicated. The analysis of rhythm may depend on interactions between the auditory and motor systems. Although auditory–motor interactions can be observed in people without formal musical training, musicians are an excellent population to study because of their long-established and rich associations between auditory and motor systems. Musicians have been shown to have anatomical adaptations that correlate with their training. Some neuroimaging studies have observed that musicians show lower levels of activity in motor regions than non-musicians during the performance of simple motor tasks, which may suggest a more efficient pattern of neural recruitment. Psychoacoustics is the scientific study of sound perception. More specifically, it is the branch of science studying the psychological and physiological responses associated with sound (including speech and music). Topics of study include perception of the pitch, timbre, loudness and duration of musical sounds and the relevance of such studies for music cognition or the perceived structure of music; and auditory illusions and how humans localize sound, which can have relevance for musical composition and the design of venues for music performance. Psychoacoustics is a branch of psychophysics. Cognitive musicology is a branch of cognitive science concerned with computationally modeling musical knowledge with the goal of understanding both music and cognition. Cognitive musicology can be differentiated from the fields of music cognition and cognitive neuroscience of music by a difference in methodological emphasis. Cognitive musicology uses computer modeling to study music-related knowledge representation and has roots in artificial intelligence and cognitive science. The use of computer models provides an exacting, interactive medium in which to formulate and test theories. Consumers' choices in music have been studied as they relate to the Big Five personality traits: openness to experience, agreeableness, extraversion, neuroticism, and conscientiousness. In general, the plasticity traits (openness to experience and extraversion) affect music preference more than the stability traits (agreeableness, neuroticism, and conscientiousness). Gender has been shown to influence preference, with men choosing music for primarily cognitive reasons and women for emotional reasons. Relationships with music preference have also been found with mood and nostalgic association. The study of background music focuses on the impact of music with non-musical tasks, including changes in behavior in the presence of different types, settings, or styles of music. In laboratory settings, music can affect performance on cognitive tasks (memory, attention, and comprehension), both positively and negatively. Used extensively as an advertising aid, music may also affect marketing strategies, ad comprehension, and consumer choices. Background music can influence learning, working memory and recall, performance while working on tests, and attention in cognitive monitoring tasks. Background music can also be used as a way to relieve boredom, create positive moods, and maintain a private space. Background music has been shown to put a restless mind at ease by presenting the listener with various melodies and tones. In both radio and television advertisements, music plays an integral role in content recall, intentions to buy the product, and attitudes toward the advertisement and brand itself. Music's effect on marketing has been studied in radio ads, TV ads, and physical retail settings. One of the most important aspects of an advertisement's music is the "musical fit", or the degree of congruity between cues in the ad and song content. Advertisements and music can be congruous or incongruous for both lyrical and instrumental music. The timbre, tempo, lyrics, genre, mood, as well as any positive or negative associations elicited by certain music should fit the nature of the advertisement and product. Several studies have recognized that listening to music while working affects the productivity of people performing complex cognitive tasks. One study suggested that listening to one’s preferred genre of music can enhance productivity in the workplace, though other research has found that listening to music while working can be a source of distraction, with loudness and lyrical content possibly playing a role. Other factors proposed to affect the relationship between music listening and productivity include musical structure, task complexity, and degree of control over the choice and use of music. Musical aptitude refers to a person's innate ability to acquire skills and knowledge required for musical activity, and may influence the speed at which learning can take place and the level that may be achieved. Study in this area focuses on whether aptitude can be broken into subsets or represented as a single construct, whether aptitude can be measured prior to significant achievement, whether high aptitude can predict achievement, to what extent aptitude is inherited, and what implications questions of aptitude have on educational principles. It is an issue closely related to that of intelligence and IQ, and was pioneered by the work of Carl Seashore. While early tests of aptitude, such as Seashore's The Measurement of Musical Talent, sought to measure innate musical talent through discrimination tests of pitch, interval, rhythm, consonance, memory, etc., later research found these approaches to have little predictive power and to be influenced greatly by the test-taker's mood, motivation, confidence, fatigue, and boredom when taking the test. In 1997 Karageorhis, Costas and Terry, Peter C. did a review over the effects of music in sports. Although you may think that maybe not all people are affected to "music" since you may need to be able to hear, that is not true. Deaf people can understand the music by the sounds. There was an article that their main goal was to investigate if Deaf people could have the same emotions as the artist is portraying in their songs and also if there is a difference from a Deaf listener to a normal hearing person. Their result was that 40% and 48% Deaf students correlated with the same emotions that the artist was portraying in their song. For Deaf people they connect loud music to be animated or happy music. And soft music to be delicate or peaceful. ^ "Musicology". Encyclopedia Britannica. Retrieved 2019-03-29. ^ Thompson, William Forde. Music, Thought, and Feeling: Understanding the Psychology of Music, 2nd Edition. New York: Oxford University Press. p. 320. ISBN 0195377079. ^ a b c Deutsch, Diana. "Psychology of Music, History, Antiquity to the 19th century". Grove Music Online, Oxford Music Online. Oxford University Press. Retrieved 9 April 2014. ^ a b Gabrielsson, Alf. "Psychology of Music, History, 1860-1960". Grove Music Online, Oxford Music Online. Oxford University Press. Retrieved 9 April 2014. ^ Sloboda, John. "Psychology of Music, History, The late 20th century". Grove Music Online, Oxford Music Online. Oxford University Press. Retrieved 9 April 2014. ^ Ockelford, Adam (2009). "Beyond music psychology". In Hallam, Susan; Cross, Ian; Thaut, Michael. The Oxford Handbook of Music Psychology. Oxford: Oxford University Press. p. 539. ISBN 978-0-19-929845-7. ^ Thaut, Micahel (2009). "History and research". In Hallam, Susan; Cross, Ian; Thaut, Michael. The Oxford Handbook of Music Psychology. Oxford: Oxford University Press. p. 556. ISBN 978-0-19-929845-7. ^ Thaut, Micahel (2009). "History and research". In Hallam, Susan; Cross, Ian; Thaut, Michael. The Oxford Handbook of Music Psychology. Oxford: Oxford University Press. p. 559. ISBN 978-0-19-929845-7. ^ Thompson, William Forde; Balkwill, Laura-Lee (2010). "Cross-cultural similarities and differences". In Juslin, Patrik; Sloboda, John. Handbook of Music and Emotion: Theory, Research, Applications (ch. 27). Oxford: Oxford University Press. pp. 755–788. ISBN 9780199604968. ^ Abbott, Alison. "Mozart doesn't make you clever". Nature.com. Retrieved 2014-04-22. ^ Sloboda, John. "Psychology of Music, Affect". Grove Music Online, Oxford Music Online. Oxford University Press. Retrieved 16 April 2014. ^ Salimpoor, VN; Benovoy, M; Larcher, K; Dagher, A; Zatorre, RJ (2011). "Anatomically distinct dopamine release during anticipation and experience of peak emotion to music". Nature Neuroscience. 14 (2): 257–62. doi:10.1038/nn.2726. PMID 21217764. ^ Zatorre, Robert J.; Chen, Joyce L.; Penhune, Virginia B. (2007). "When the Brain Plays Music: Auditory–motor Interactions in Music Perception and Production". Nature Reviews Neuroscience. 8 (7): 547–58. doi:10.1038/nrn2152. ^ a b c d Zatorre, R. J.; Halpern, A. R. (2005). "Mental concerts: musical imagery and auditory cortex". Neuron. 47: 9–12. doi:10.1016/j.neuron.2005.06.013. PMID 15996544. ^ Bendor, D.; Wang, X. (2005). "The neuronal representation of pitch in primate auditory cortex". Nature. 436: 1161–1165. doi:10.1038/nature03867. PMC 1780171. PMID 16121182. ^ Zatorre1, R. J. (1988). "Pitch perception of complex tones and human temporal-lobe function". J. Acoust. Soc. Am. 84: 566–572. doi:10.1121/1.396834. ^ Johnsrude, I. S.; Penhune, V. B.; Zatorre, R. J. (2000). "Functional specificity in the right human auditory cortex for perceiving pitch direction". Brain. 123: 155–163. doi:10.1093/brain/123.1.155. ^ Penagos, H.; Melcher, J. R.; Oxenham, A. J. (2004). "A neural representation of pitch salience in nonprimary human auditory cortex revealed with functional magnetic resonance imaging". J. Neurosci. 24: 6810–6815. doi:10.1523/jneurosci.0383-04.2004. PMC 1794212. ^ Takeuchi, Annie H.; Hulse, Stewart H. (1993). "Absolute pitch". Psychological Bulletin. 113 (2): 345–61. doi:10.1037/0033-2909.113.2.345. PMID 8451339. ^ Oliver Sacks (May 1995). "Letters: Musical Ability". Science. 268 (5211): 621–622. doi:10.1126/science.7732360. PMID 7732360. ^ Snyder, Bob (2009). "Memory for music". In Hallam, Susan; Cross, Ian; Thaut, Michael. The Oxford Handbook of Music Psychology. Oxford: Oxford University Press. p. 111. ISBN 978-0-19-929845-7. ^ Krumhansl, C. L. (2000). "Rhythm and pitch in music cognition". Psychol. Bull. 126: 159–179. doi:10.1037/0033-2909.126.1.159. ^ Jones, M. R.; Moynihan, H.; MacKenzie, N.; Puente, J. (2002). "Temporal aspects of stimulus-driven attending in dynamic arrays". Psychol Sci. 13: 313–319. doi:10.1111/1467-9280.00458. ^ Penhune, V. B.; Zatorre, R. J.; Feindel, W. H. (1999). "The role of auditory cortex in retention of rhythmic patterns in patients with temporal-lobe removals including Heschl's gyrus". Neuropsychologia. 37: 315–331. doi:10.1016/s0028-3932(98)00075-x. ^ Peretz, I. (1990). "Processing of local & global musical information by unilateral brain-damaged patients". Brain. 113: 1185–1205. doi:10.1093/brain/113.4.1185. ^ Kester, D. B.; et al. (1991). "Acute effect of anterior temporal lobectomy on musical processing". Neuropsychologia. 29: 703–708. doi:10.1016/0028-3932(91)90104-g.
^ Janata, P.; Grafton, S. T. (2003). "Swinging in the brain: shared neural substrates for behaviors related to sequencing and music". Nature Neuroscience. 6: 682–687. doi:10.1038/nn1081. PMID 12830159. ^ Sakai, K.; et al. (1999). "Neural representation of a rhythm depends on its interval ratio". J. Neurosci. 19: 10074–10081. ^ Grahn, J. A.; Brett, M. (2007). "Rhythm and beat perception in motor areas of the brain". J. Cogn. Neurosci. 19: 893–906. doi:10.1162/jocn.2007.19.5.893. ^ Chen, J. L., Penhune, V. B. & Zatorre, R. J. in Society for Neuroscience Abst. 747.15 (Atlanta GA, 2006). ^ Hund-Georgiadis, M.; von Cramon, D. Y. (1999). "Motorlearning-related changes in piano players and nonmusicians revealed by functional magnetic-resonance signals". Exp Brain Res. 125: 417–425. doi:10.1007/s002210050698. ^ Jancke, L.; Shah, N. J.; Peters, M. (2000). "Cortical activations in primary and secondary motor areas for complex bimanual movements in professional pianists". Brain Res Cogn Brain Res. 10: 177–183. doi:10.1016/s0926-6410(00)00028-8. ^ Koeneke, S.; Lutz, K.; Wustenberg, T.; Jäncke, L. (2004). "Longterm training affects cerebellar processing in skilled keyboard players". NeuroReport. 15: 1279–1282. doi:10.1097/01.wnr.0000127463.10147.e7. PMID 15167549. ^ a b Meister, I. G.; et al. (2004). "Playing piano in the mind—an fMRI study on music imagery and performance in pianists". Brain Res Cogn Brain Res. 19: 219–228. doi:10.1016/j.cogbrainres.2003.12.005. ^ Callicott, J. H.; Mattay, V. S.; Duyn, J. H.; Weinberger, D. R. (2002). "Cortical systems associated with covert music rehearsal". NeuroImage. 16: 901–908. doi:10.1006/nimg.2002.1144. ^ Bregman, Albert (1994). Auditory Scene Analysis: The Perceptual Organization of Sound, p.76. ISBN 0-262-52195-4. ^ Honing, H.; Ploeger, A. (2012). "Cognition and the Evolution of Music: Pitfalls and Prospects". Topics in Cognitive Science. 4: 513–524. doi:10.1111/j.1756-8765.2012.01210.x. ^ Soley, G.; Hannon, E. E. (2010). "Infants prefer the musical meter of their own culture: A cross-cultural comparison". Developmental Psychology. 46: 286–292. doi:10.1037/a0017555. PMID 20053025. ^ Balkwill, L.; Thompson, W. F.; Matsunaga, R. (2004). "Recognition of emotion in Japanese, Western, and Hindustani music by Japanese listeners". Japanese Psychological Research. 46: 337–349. doi:10.1111/j.1468-5584.2004.00265.x. ^ Groussard, M.; Rauchs, G.; Landeau, B.; Viader, F.; Desgranges, B.; Eustache, F.; Platel, H. (2010). "The neural substrates of musical memory revealed by fMRI and two semantic tasks". NeuroImage. 53: 1301–1309. doi:10.1016/j.neuroimage.2010.07.013. PMID 20627131. ^ Miranda, Dave; Morizot, Julien; Gaudreau, Patrick (27 March 2012). "Personality Metatraits and Music Preferences in Adolescence: A Pilot Study". International Journal of Adolescence and Youth. 15 (4): 289–301. doi:10.1080/02673843.2010.9748036. ^ Chamorro-Premuzic, Tomas; Swami, Viren; Cermakova, Blanka (22 December 2010). "Individual differences in music consumption are predicted by uses of music and age rather than emotional intelligence, neuroticism, extraversion or openness". Psychology of Music. 40 (3): 285–300. doi:10.1177/0305735610381591. ^ Vuoskoski, Jonna K.; Eerola, Tuomas (13 July 2011). "Measuring music-induced emotion: A comparison of emotion models, personality biases, and intensity of experiences". Musicae Scientiae. 15 (2): 159–173. doi:10.1177/1029864911403367. ^ Barret, Frederick S.; Grimm, Kevin J.; Robins, Richard W.; Wildschut, Tim; Constantine, Sedikides; Janata, Petr (June 2010). "Music-evoked nostalgia: Affect, memory, and personality". Emotion. 10 (3): 390–403. doi:10.1037/a0019006. PMID 20515227. ^ Kampfe, J.; Sedlmeier, P.; Renkewitz, F. (8 November 2010). "The impact of background music on adult listeners: A meta-analysis". Psychology of Music. 39 (4): 424–448. doi:10.1177/0305735610376261. ^ de Groot, Annette M. B. (1 September 2006). "Effects of Stimulus Characteristics and Background Music on Foreign Language Vocabulary Learning and Forgetting". Language Learning. 56 (3): 463–506. doi:10.1111/j.1467-9922.2006.00374.x. ^ Aheadi, A.; Dixon, P.; Glover, S. (21 July 2009). "A limiting feature of the Mozart effect: listening enhances mental rotation abilities in non-musicians but not musicians". Psychology of Music. 38 (1): 107–117. doi:10.1177/0305735609336057. ^ Alley, Thomas R.; Greene, Marcie E. (16 October 2008). "The Relative and Perceived Impact of Irrelevant Speech, Vocal Music and Non-vocal Music on Working Memory". Current Psychology. 27 (4): 277–289. doi:10.1007/s12144-008-9040-z. ^ Cassidy, G.; MacDonald, R. A.R. (1 July 2007). "The effect of background music and background noise on the task performance of introverts and extraverts". Psychology of Music. 35 (3): 517–537. doi:10.1177/0305735607076444. ^ Patston, Lucy L. M.; Tippett, Lynette J. (1 December 2011). "The Effect of Background Music on Cognitive Performance in Musicians and Nonmusicians". Music Perception: An Interdisciplinary Journal. 29 (2): 173–183. doi:10.1525/mp.2011.29.2.173. ^ Avila, C.; Furnham, A.; McClelland, A. (9 November 2011). "The influence of distracting familiar vocal music on cognitive performance of introverts and extraverts". Psychology of Music. 40 (1): 84–93. doi:10.1177/0305735611422672. ^ Olivers, Christian N.L. ; Nieuwenhuis, Sander (1 April 2005). "The Beneficial Effect of Concurrent Task-Irrelevant Mental Activity on Temporal Attention". Psychological Science. 16 (4): 265–269. doi:10.1111/j.0956-7976.2005.01526.x. PMID 15828972. ^ Beanland, Vanessa; Allen, Rosemary A.; Pammer, Kristen (1 December 2011). "Attending to music decreases inattentional blindness". Consciousness and Cognition. 20 (4): 1282–1292. doi:10.1016/j.concog.2011.04.009. ^ a b Schäfer, Thomas; Sedlmeier, Peter; Städtler, Christine; Huron, David (2013). "The psychological functions of music listening". Frontiers in Psychology. 4. doi:10.3389/fpsyg.2013.00511. ISSN 1664-1078. ^ a b Hahn, Minhi; Hwang, Insuk (1 December 1999). "Effects of tempo and familiarity of background music on message processing in TV advertising: A resource-matching perspective". Psychology and Marketing. 16 (8): 659–675. doi:10.1002/(SICI)1520-6793(199912)16:8<659::AID-MAR3>3.0.CO;2-S.
^ a b Park, C. Whan; Young, S. Mark (1 February 1986). "Consumer Response to Television Commercials: The Impact of Involvement and Background Music on Brand Attitude Formation". Journal of Marketing Research. 23 (1): 11. doi:10.2307/3151772. ^ a b Oakes, Steve; North, Adrian C. (1 May 2006). "The impact of background musical tempo and timbre congruity upon ad content recall and affective response". Applied Cognitive Psychology. 20 (4): 505–520. doi:10.1002/acp.1199. ^ a b Lalwani, Ashok K.; Lwin, May O.; Ling, Pee Beng (14 April 2009). "Does Audiovisual Congruency in Advertisements Increase Persuasion? The Role of Cultural Music and Products". Journal of Global Marketing. 22 (2): 139–153. doi:10.1080/08911760902765973. ^ a b Zander, M. F. (1 October 2006). "Musical influences in advertising: how music modifies first impressions of product endorsers and brands". Psychology of Music. 34 (4): 465–480. doi:10.1177/0305735606067158. ^ a b Lavack, Anne M.; Thakor, Mrugank V.; Bottausci, Ingrid (1 January 2008). "Music-brand congruency in highand low-cognition radio advertising". International Journal of Advertising. 27 (4): 549. doi:10.2501/S0265048708080141. ^ Eroglu, Sevgin A.; Machleit, Karen A.; Chebat, Jean-Charles (1 July 2005). "The interaction of retail density and music tempo: Effects on shopper responses". Psychology and Marketing. 22 (7): 577–589. doi:10.1002/mar.20074. ^ Chebat, Jean-Charles; Chebat, Claire Gélinas; Vaillant, Dominique (1 November 2001). "Environmental background music and in-store selling". Journal of Business Research. 54 (2): 115–123. doi:10.1016/S0148-2963(99)00089-2. ^ a b OAKES, STEVE (1 January 2007). "Evaluating Empirical Research into Music in Advertising: A Congruity Perspective". Journal of Advertising Research. 47 (1): 38. doi:10.2501/S0021849907070055. ^ "Is Background Music a Boost or a Bummer?". Psychology Today. Retrieved 2018-04-17. ^ Lesiuk, Teresa (29 June 2016). "The effect of music listening on work performance". Psychology of Music. 33 (2): 173–191. doi:10.1177/0305735605050650. ^ "Music at work: distracting or beneficial? - Anneli B. Haake PhD". musicatwork.net. Retrieved 2018-04-17. ^ "Research Shows Listening to Music Increases Productivity (and Some Types of Music Are Super Effective)". Inc.com. 2017-09-19. Retrieved 2018-04-17. ^ a b O'Neill, Susan; Sloboda, John. "Psychology of Music, Musical ability". Grove Music Online, Oxford Music Online. Oxford University Press. Retrieved 17 April 2014. ^ Platz, F.; Kopiez, R. (September 2012). "When the Eye Listens: A Meta-analysis of How Audio-visual Presentation Enhances the Appreciation of Music Performance". Music Perception. 30 (1): 71–83. doi:10.1525/mp.2012.30.1.71. JSTOR 10.1525/mp.2012.30.1.71. ^ Shelvock, Matt. "Gestalt Theory and Mixing Audio". Innovation in Music II. ^ "Dt. Gesellsch. f. Musikpsychologie" (in German). Retrieved 23 July 2012. ^ "Journal of Mathematics and Music". Retrieved 6 April 2014. ^ "Macquarie University; Music, Sound and Performance Lab". Retrieved 6 April 2014. ^ "Melbourne University; Music, Music, Mind and Wellbeing Initiative". Retrieved 9 April 2014. ^ "UNSW; Empirical Musicology Group". Retrieved 8 December 2014. ^ "University of Western Australia; ARC Centre of Excellence for the History of Emotion". Retrieved 8 December 2014. ^ "University of Western Sydney; The MARCS Institute". Retrieved 9 April 2014. ^ "University of Graz; Centre for Systematic Musicology". Retrieved 6 April 2014. ^ "University of Klagenfurt; Cognitive Psychology Unit". Retrieved 8 April 2014. ^ "Ghent University; Institute for Psychoacoustics and Electronic Music". Retrieved 9 April 2014. ^ "McGill University; CIRMMT". Retrieved 6 April 2014. ^ "University of Toronto; MaHRC". Retrieved 6 April 2014. ^ "Queens University; Music Cognition Lab". Retrieved 6 April 2014. ^ "University of PEI; Auditory Perception and Music Cognition Research and Training Laboratory". Retrieved 6 April 2014. ^ "Ryerson University; SMART Lab". Retrieved 6 April 2014. ^ "McMaster University; MAPLE Lab". Retrieved 17 January 2015. ^ "McMaster University; MIMM". Retrieved 6 April 2014. ^ "BRAMS - International Laboratory for Brain, Music, and Sound Research". Retrieved 6 April 2014. ^ "University of Montreal; Centre for Research on Brain, Language and Music". Retrieved 6 April 2014. ^ "University of Western Ontario; Music and Neuroscience Lab". Retrieved 9 April 2014. ^ "Aarhus University; Center for Music in the brain". Retrieved 17 October 2017. ^ "University of Jyväskylä, Finnish Centre of Excellence in Interdisciplinary Music Research". Retrieved 9 April 2014. ^ "Claude Bernard University Lyon 1; CAP,". Retrieved 9 April 2014. ^ "Centre Pompidou; IRCAM; Research". Retrieved 19 April 2014. ^ "Institute for Systematic Musicology, Universität Hamburg". Retrieved 15 December 2017. ^ "HMTMH; Institute of Music Physiology and Musicians' Medicine". Retrieved 9 April 2014. ^ "HMTMH; Hanover Music Lab". Retrieved 15 December 2017. ^ "University of Iceland, Research Units". Retrieved 19 April 2014. ^ "University of Amsterdam; Music Cognition Group". Archived from the original on 22 May 2016. Retrieved 6 April 2014. ^ "Norwegian Academy of Music; Centre for Music and Health". Retrieved 21 April 2014. ^ "FC University of Music; Unit of Psychology of Music". Retrieved 6 April 2014. ^ "University of Finance and Management in Warsaw; Music Performance and Brain Lab". Retrieved 21 April 2014. ^ "Institute of High Performance Computing, A*STAR; Music Cognition Group". Retrieved 15 Jan 2018. ^ "Pompeu Fabra University; Music Technology Group". Retrieved 23 April 2014. ^ "Royal Institute of Technology, Speech, Music and Hearing". Retrieved 6 April 2014. ^ "Uppsala University; Music Psychology Group". Retrieved 21 April 2014. ^ "Cambridge University; Centre for Music and Science". Retrieved 6 April 2014. ^ "University of Edinburgh; Music and the Human Sciences". Retrieved 6 April 2014. ^ "Keele University; Centre for Psychological Research". Retrieved 6 April 2014. ^ "Durham University; Music and Science Lab". Retrieved 10 December 2017. ^ "University of Leeds; ICSRiM". Retrieved 6 April 2014. ^ "University of Leicester; Social and Applied Psychology Group". Retrieved 6 April 2014. ^ "Goldsmiths; Music, Mind and Brain". Retrieved 6 April 2014. ^ "UCL Institute of Education; International Music Education Research Centre". Retrieved 6 April 2014. ^ "Queen Mary University of London; Music Cognition Lab". Retrieved 22 April 2014. ^ "University of Oxford; Psychology of Music". Retrieved 12 April 2014. ^ "University of Roehampton; Applied Music Research Centre". Retrieved 6 April 2014. ^ "Royal College of Music; Centre for Performance Science". Retrieved 6 April 2014. ^ "Royal Northern College of Music; Centre for Music Performance Research". Retrieved 6 April 2014. ^ "Sheffield University; Department of Music, Psychology of Music Research". Retrieved 6 April 2014. ^ "University of Arkansas; Music Cognition Lab". Retrieved 6 April 2014. ^ "Music and Neuroimaging Laboratory". Retrieved 28 April 2014. ^ "University at Buffalo; Auditory Perception & Action Lab". Retrieved 29 April 2014. ^ "UCD; Janata Lab". Retrieved 29 April 2014. ^ "UCLA; Roger Kendall Bio". Retrieved 21 April 2014. ^ "UCSD; Diana Deutsch profile". Retrieved 29 April 2014. ^ "UCSB Music Cognition Lab". Retrieved 26 March 2019. ^ Foran, Sheila. "Theoretical Neuroscientist Ed Large Joins UConn Faculty". UConn Today. Retrieved 4 May 2014. ^ "Cornell University; The Music Cognition Laboratory". Retrieved 28 April 2014. ^ "University of Rochester; Music Cognition at Eastman School of Music". Retrieved 8 April 2014. ^ "Florida State University; Center for Music Research". Retrieved 21 April 2014. ^ "Louisiana State University; Music Cognition and Computation Lab". Retrieved 29 February 2016. ^ "University of Maryland; Language and Music Cognition Lab". Retrieved 29 April 2014. ^ "UNLV; Auditory Cognition and Development Lab". Retrieved 29 April 2014. ^ "Northwestern University; Auditory Neuroscience Laboratory". Retrieved 29 April 2014. ^ "Northwestern University; Music Theory and Cognition Program". Retrieved 21 April 2014. ^ "Ohio State University; Cognitive and Systematic Musicology Laboratory". Retrieved 8 April 2014. ^ "University of Oregon; Music Learning, Perception, and Cognition Focus Group". Retrieved 21 April 2014. ^ "Stanford University; Center for Computer Research in Music and Acoustics". Retrieved 6 April 2014. ^ "University of Texas at Dallas; Dowling Laboratory". Retrieved 21 April 2014. ^ "University of Texas at San Antonio; Institute for Music Research". Retrieved 21 April 2014. ^ "University of Washington; MCCL". Retrieved 28 April 2014. ^ "Wesleyan University; MIND Lab". Retrieved 28 October 2014. ^ "Western Michigan University; BRAIN Lab". Retrieved 29 April 2014. Palmer, Caroline & Melissa K. Jungers (2003): Music Cognition. In: Lynn Nadel: Encyclopedia of Cognitive Science, Vol. 3, London: Nature Publishing Group, pp. 155–158. Day, Kingsley (October 21, 2004). "Music and the Mind: Turning the Cognition Key". Observer online. Jourdain, Robert (1997). Music, the Brain, and Ecstasy: How Music Captures Our Imagination. New York: William Morrow and Company. ISBN 0-688-14236-2. Honing, Henkjan (2013). "Musical Cognition. A Science of Listening (2nd edition)." New Brunswick, N.J.: Transaction Publishers. ISBN 978-1412852920. Margulis, Elizabeth Hellmuth. (2018). ''The Psychology of Music: A Very Short Introduction. New York, NY: Oxford University Press. ISBN 978-0190640156. Margulis, Elizabeth Hellmuth. (2013). ''On Repeat: How Music Plays the Mind. New York, NY: Oxford University Press. ISBN 978-0199990825. Purwins; Hardoon (2009). "Trends and Perspectives in Music Cognition Research and Technology" (PDF). Connection Science. 21 (2–3): 85–88. doi:10.1080/09540090902734549. Snyder, Bob (2000). "Music and Memory: an introduction" The MIT Press. ISBN 0-262-69237-6. J.P.E. Harper-Scott and Jim Samson 'An Introduction to Music Studies', Chapter 4: John Rink,The Psychology of Music, (Cambridge University Press, 2009), pp. 60. Deutsch, D. (Ed.) (1982). The Psychology of Music, 1st Edition. New York: Academic Press. ISBN 0-12-213562-8. Deutsch, D. (Ed.) (1999). The Psychology of Music, 2nd Edition. San Diego: Academic Press. ISBN 0-12-213565-2. Deutsch, D. (Ed.) (2013). The Psychology of Music, 3rd Edition. San Diego: Academic Press. ISBN 0-12-381460-X. Dowling, W. Jay and Harwood, Dane L. (1986). Music Cognition. San Diego: Academic Press. ISBN 0-12-221430-7. Hallam, Cross, & Thaut, (eds.) (2008). The Oxford Handbook of Music Psychology. Oxford: Oxford University Press. Krumhansl, Carol L. (2001). Cognitive Foundations of Musical Pitch. Oxford: Oxford University Press. ISBN 0-19-514836-3. Patel, Anirrudh D. (2010). Music, language, and the brain. New York: Oxford University Press. Parncutt, R. (1989). Harmony: A Psychoacoustical Approach. Berlin: Springer. Sloboda, John A. (1985). The Musical Mind: The Cognitive Psychology of Music. Oxford: Oxford University Press. ISBN 0-19-852128-6. Lerdahl, F. and Jackendoff, R. (21996) A Generative Theory of Tonal Music. The MIT Press. ISBN 978-0-262-62107-6. Jackendoff, Ray (1987): Consciousness and the Computational Mind. Cambridge: MIT Press. Chapter 11: Levels of Musical Structure, section 11.1: What is Musical Cognition? Temperley, D. (2004). The Cognition of Basic Musical Structures. The MIT Press. ISBN 978-0-262-70105-1. Thompson, W. F. (2009). Music, Thought, and Feeling: Understanding the Psychology of Music New York: Oxford University Press. ISBN 978-0-19-537707-1. Zbikowski, Lawrence M. (2004). Conceptualizing Music: Cognitive Structure, Theory, and Analysis. Oxford University Press, USA. ISBN 978-0-19-514023-1. North, A.C. & Hargreaves, D.J. (2008). The Social and Applied Psychology of Music. Oxford: Oxford University Press. ISBN 978-0-19-856742-4.